Over the last few decades, Aurubis has developed a range of factory applied surface treatments to provide straightaway the various stages of oxidisation and patination. The processes involved are very similar to those taking place over time in the environment and utilise copper mineral compounds, not alien chemical treatments. Essentially, they bring forward the environmental changes without taking away the integrity of Aurubis copper as a natural, living material. Nordic Standard is mill finish copper without any additional surface treatments carried out in the factory. It has the traditional ‘bright' finish that will develop and change in the environment. 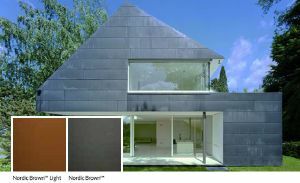 Nordic Brown™ products are pre-oxidised at Aurubis' factory to give straightaway the same oxidised brown surface that otherwise develops over time in the environment. 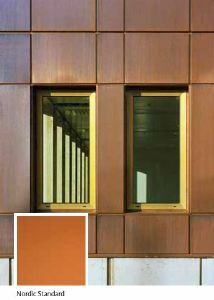 The thickness of the oxide layer determines the colour: both Nordic Brown™ Light and the darker Nordic Brown™ products are useful to minimise hand and other construction marks that can occur for a short time after installation with ‘bright' standard copper. But light and dark versions can also be combined – perhaps with other finishes such as Nordic Standard – to create various visual effects. 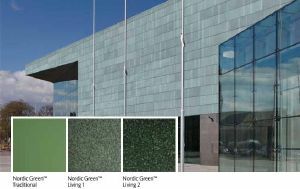 Nordic Green™ products offer designers unparalleled design freedom and the ability to determine the type and intensity of green patina for each project with choices of ‘Living' surfaces. In a carefully controlled, factory process, pre-oxidised copper is treated with specifically formulated copper compounds to create the desired patina colours and heat-treated to chemically bind them to the copper. The factory process can be accurately controlled so that, as well as the solid green patina colour, other intensities of patina flecks can be created revealing some of the dark oxidised background material. 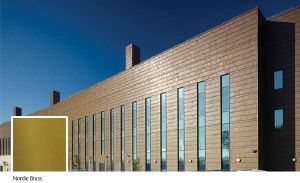 Aurubis' experts can also work in partnership with architects to develop special individual levels of patination to meet their design requirements or to match historically patinated copper on existing buildings. The material is easily bent and formed, and there are no limitations on the length of pre-patinated copper sheet or strip because whole coils are treated on the production line, not just limited size sheets. Nordic Green™ is available in sheets or coils with one surface treated. Nordic Blue™ products offer designers unparalleled design freedom and the ability to determine the type and intensity of blue patina for each project with choices of ‘Living' surfaces. In a carefully controlled, factory process, pre-oxidised copper is treated with specifically formulated copper compounds to create the desired patina colours and heat-treated to chemically bind them to the copper. The factory process can be accurately controlled so that, as well as the solid blue patina colour, other intensities of patina flecks can be created revealing some of the dark oxidised background material. 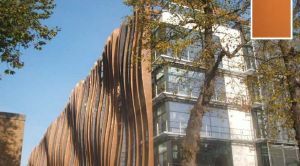 Aurubis' experts can also work in partnership with architects to develop special individual levels of patination to meet their design requirements or to match historically patinated copper on existing buildings. The material is easily bent and formed, and there are no limitations on the length of pre-patinated copper sheet or strip because whole coils are treated on the production line, not just limited size sheets. 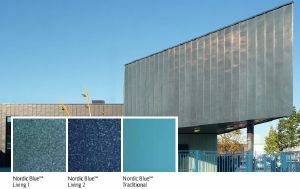 Nordic Blue™ is available in sheets or coils with one surface treated. Nordic Brass is an alloy of copper and zinc with a distinctive golden yellow colour. When exposed to the atmosphere, the surface begins to darken within weeks and can change to a dark brown in around a year – unlike Nordic Royal™ alloy which retains its original colour. Nordic Bronze is an alloy of copper and tin with a similar colour to Nordic Standard initially. When exposed to the atmosphere, the surface gradually changes to a stable, dark chocolate brown. This process is slower than with Nordic Brass. Nordic Royal™ is an alloy of copper with aluminium and zinc, giving it a rich golden through-colour and making it very stable. It has a thin protective oxide layer containing all three alloy elements when produced. As a result, the surface retains its golden colour and simply loses some of its sheen as the oxide layer thickens with exposure to the atmosphere to give a matt finish. 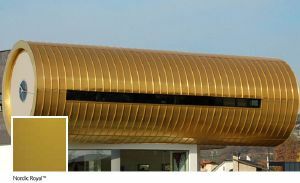 It behaves differently to other Aurubis copper products over time and does not develop a blue or green patina.